All Lemurians have a very powerful & unique energy signature. The way that they refract light reminds one more of a diamond than quartz. When placed on a light base, Lemurians exhibit the qualities of a laser like wand, or even a light saber of “Star Wars” fame. This quality of light transference is the fingerprint of true Lemurian seed crystals. Lemurians occur naturally with multiple striations, and Katrina Raphaell and some other crystal healers consider the crystals more valuable when these striations have been left intact & not polished off , although the majority believes that both polished and unpolished Lemurian crystals have immensely powerful energies useful in healing, meditation and spiritual practice of all kinds. The multiple striations on Lemurian crystals are a resonant library that contains information from the ancient civilization of Lemuria. Lemurian crystals are said to be tuned to energies of unity, and to help us to balance the spiritual and physical aspects of our lives. According to the crystal dealers that we work with, Lemurian seed crystals are perfect examples of a crystalline structure created by what is known as the “Muzo crystal growth habit”. Rykart, commenting on crystals from Muzo in Colombia, first described this habit. A similar crystal “habit” or structure has also been found on rock crystals from pegmatites in Minas Gerais, Brazil, and from alpinotype vugs in Switzerland. 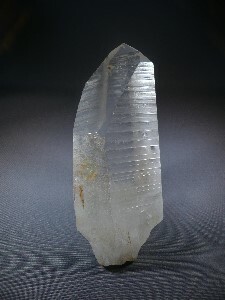 Many Lemurian seed crystals, commonly known as “Laser wands”, display the defining characteristics of the “Muzo habit”. Muzo habit crystals display horizontal striations up and down the shaft, and can form very steep termination tips, such that a cross section of the upper end of the shaft appears triangular, although the lower body of the shaft remains hexagonal in shape. It is said that the Lemurian high stewards placed these crystals strategically along the so-called Dragons Net of Ley lines. Ley lines are alignments and patterns of powerful, invisible earth energy said to connect various sacred sites, such as churches, temples, stone circles, megaliths, holy wells, burial sites, and other locations of spiritual or magical importance. The scientific belief is that these lines are areas of altered magnetic fields. In this way, the resonant Lemurian Vibration is channeled throughout the Dragons energy systems. This explains why Lemurian crystals are found in Brazil, in Russia, and in other locations, none of which map closely onto the locations identified with Lemuria by the Theosophical seers who originally envisioned this ancient civilization in their clairvoyant meditations. ©2008 Mark Naea, no reproduction without written consent.